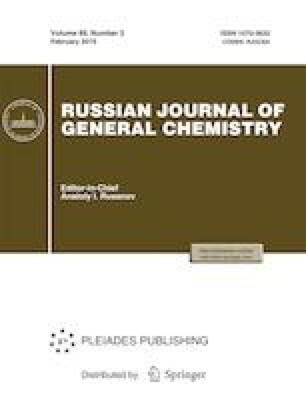 Two-stage condensation of cycloalkyl ketones with dimethyl oxalate or alkyl acetates with dialkyl oxalates and cycloalkyl ketones produced disodium 1,2-bis(2-oxocycloalkylidene)ethane-1,2-diolates and disodium 4-alkoxy-4-oxo-1-(2-oxocycloalkylidene)but-2-ene-1,2-diolates, respectively. The structural features of the obtained compounds were discussed on the basis of their IR, 1H NMR spectroscopy, and mass spectrometry data. Russian Text © P.P. Mukovoz, E.S. Dankovtseva, V.P. Mukovoz, V.V. Abramova, N.A. Chigrineva, E.A. Danilova, 2019, published in Zhurnal Obshchei Khimii, 2019, Vol. 89, No. 2, pp. 223–229.